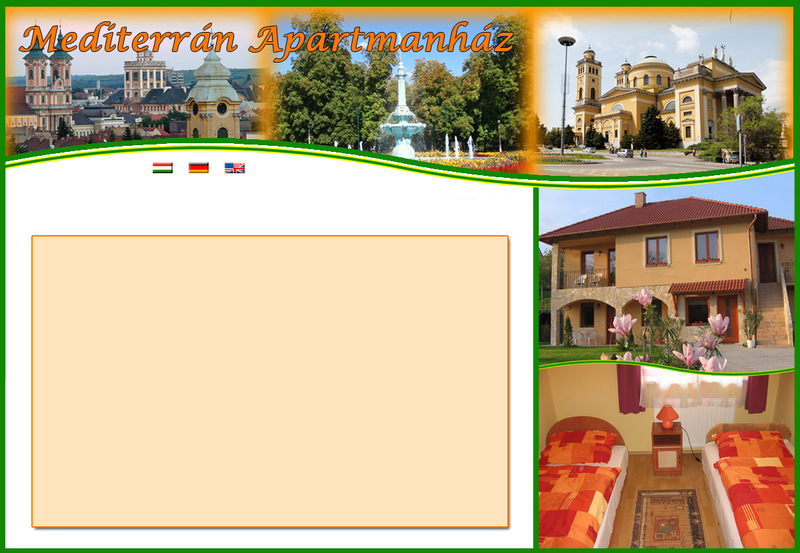 The Mediterranian Apartmanthouse welcomes you to Eger! Situated in the peaceful suburbs of Eger, near the „Valley of the Beautiful Woman”,which is famous for its wine cellars, the Mediterran Apartmanthouse is waiting for its guests! Crystal-clear air, calm atmosphere are offerd to the visitors who can have a rest in a nicely designed house. The location makes the historical downtown and also a thermal-bath easy to approach with a short walk. Experience the magical thermal waters of Egerszalók and Demjén’s spas, which are only a 15 minute drive from our lodging. The medical waters of the spas are suitable for curing joint, spine, bone and nervous-system problems. The three apartmants have a bedroom with a colour TV and consist of a well-equiped kitchen ( fridge, microwave oven, electric cooker, tea-maker, toaster), and a bathroom. On request, an extra bed and a child cot is also possible. Besides these, a well-equipped studio apartment is also available for our guests.